Israel has launched two night-time air strikes on the Gaza Strip which has left a number of people wounded, Palestinian medical sources said. The Israeli air force bombed a target in the north of Gaza and struck tunnels in the south, near the border with Egypt. Palestinian medical sources told reporters that about 22 people had been injured, two seriously. The attacks come a day after militants in Gaza fired mortars into Israel. One of the seriously wounded Palestinians was 15, Palestinian medical sources said. 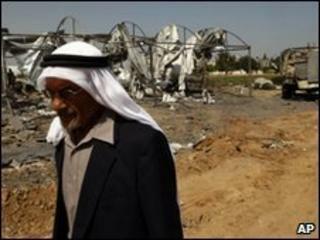 The Israeli Defense Forces confirmed the attacks in Beit Hanoun, east of Gaza City, and Rafah in the south. "The tunnels were dug 1km from the security fence and were intended for infiltrating into Israel and executing terror attacks," a spokesman told the news agency Agence France Presse. The attacks come just hours after a donkey cart carrying dynamite exploded on the border between Gaza and Israel. The donkey was killed in the explosion, which was aimed at blowing a hole in the security fence. Militants later fired two mortars into Israel, but there were no reported casualties.